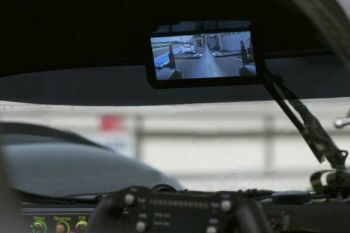 Audi's R18 sports prototype cars just got a new addition: an AMOLED digital rear view "mirror". They say that the AMOLED display was chosen because of the high density, excellent image quality and very fast response time - even at 330 km/h (92 meters per second) the image is still fluid, according to Audi. It's also quite light, in fact probably lighter than a traditional mirror. A digital mirror also providers other advantages of course: it can display information (current gear, warnings, etc) and it also behaves better than a traditional mirror in bad weather. The camera is installed behind the antennas on the roof. This is not the first time Audi uses OLEDs. Back in March Audi unveiled three new OLED-lighting based designs: rear lights and flashing turn indicators, a car covered with hundreds of triangular panels and the "swarm" which is an external OLED lighting based "display". 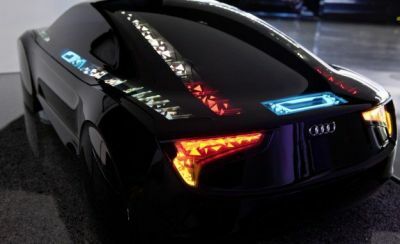 The OLED panels in Audi's concepts were provided by Philips. Amoled display will boom also in cars in some years! Audi is like BMW often first to implement new energi efficient technologies. Audi was first to use many small white LED as front light and nowadays also in backlights. If one or two LED stops to work it is no problem because the lamps is made of many so the rest of them work, that the big benefit for using many LED as light source. Amoleds on flexible amorf polyamide substrate can make mirrors semi-transparent because amorf polyamide property is both higher glass temperature than crystalline polyamide and that it is transparent.Amoleds with no current on it´s subpixels and pixels make can make Amoled displays partially or totally transparent. So, between too glass sheets an Amoled display on amorf polyamide can be partially or totally transparent. In mirrors or windshield or rear window Amoled displays can be between too glass sheets and make the mirror,windshield or rear window with new properties. There are two major problems if you want to include OLED displays in the windshield: 1) The eyes of the driver have to switch focus from the road to the OLED display because the image distance is different. That may not sound like a big deal at first, but if you think about HUDs this is actually likely to be a deal breaker. 2) Windshields crack rather easily and if the windshield includes a display the normal curing procedure for minor cracks could not be used anymore as it uses UV and/or temperature treatment which would kill the OLED. Add to that the cost increase for the windshield and lifetime issues and you have a problem. Those are the reasons why most car manufacturers seem to favor projector solutions. With these you can create images that do not require re-focusing of the eye and you keep the projector unit seperate from the windshield so repairs are still possible. Now for in-car displays like the one actually present in this article things are different. Here OLEDs are in fact likely to play a part in the future.